Stop me if you've heard this one before: recently-blinded Susy Hendrix (Audrey Hepburn, My Fair Lady) is living independently in her basement NYC apartment while photographer husband Sam (Efrem Zimbalist Jr., The FBI) is out of town. Before he left, Sam was in possession of a doll last carried by Lisa (Samantha Jones), who used it to smuggle heroin from Canada...and now con men Mike Talman (Richard Crenna, First Blood), Carlino (Jack Weston, Dirty Dancing), and Harry Roat, Jr. (Alan Arkin, in his second film appearance here) are hunting for the valuable doll. Using just about every trick in the book---and then some---to dupe unwitting Susy out of said merchandise, the three men use different approaches to get the job done. Mike and Carlino, the hired help, are just looking to trick her and make some quick money. But Roat is...different, almost predatory in his behavior. He's more willing to torment and harm Susy in his search for the doll, and considers his "employees" just as expendable. 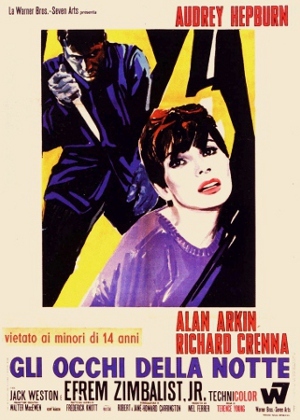 Largely shot in close quarters, Terence Young's riveting Wait Until Dark (1967) helped finalize the blueprint for modern suspense and horror films: there's plenty of nail-biting moments, a few jump scares, at least one false ending, and a somewhat convoluted and ridiculous plot that ties the whole thing together. 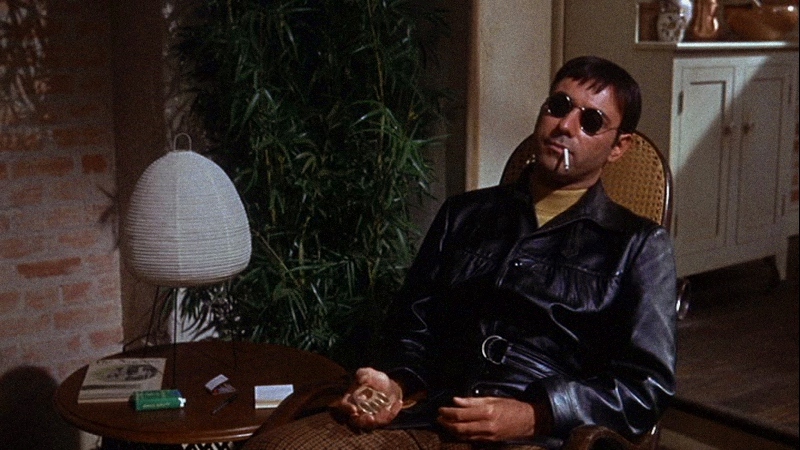 But don't let that stop you from enjoying it: once the pieces are in place, Wait Until Dark settles into a nice groove and finishes strongly with an infamous pitch-black climax that was reportedly boosted by theater owners during its original run. Other highlights include the fantastic lead performances---Arkin even pulls double duty as his own father in one scene---as well as a memorable score by Henry Mancini (The Pink Panther, Touch of Evil), and tight editing by Gene Milford (On the Waterfront). It also unfolds at a good clip: we're immediately aware of the danger...and though it takes Susy a while to catch up, her clever and resourceful nature---perhaps a bit too refined for a person blinded only a year or two ago, though Sam is shown to be an excellent and supportive "coach"---kicks in as the danger grows exponentially. 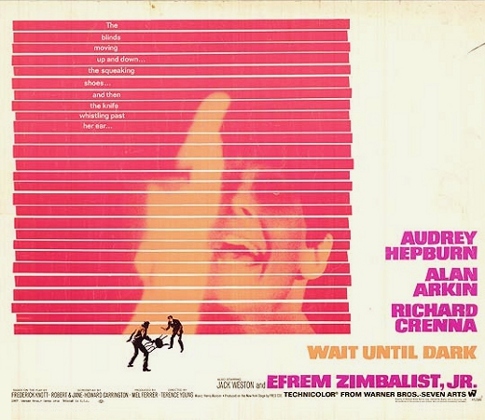 Based on the popular 1966 Broadway play written by Frederick Knott and directed by Arthur Penn (The Chase, Bonnie and Clyde), Wait Until Dark was later adapted into a 1992 HBO TV movie starring Katharine Ross (The Graduate) and remains a terrific example of strong source material translated well to the big screen. It's the kind of movie that sneaks up on first-timers and can still be enjoyed a dozen times later, thanks in no small part to the great cast and direction. It also plays exceedingly well on the small screen for obvious reasons, which makes Warner Archives' new Blu-ray edition even more enjoyable. Essentially a basic upgrade of their parent company's 2003 DVD, we're treated to a solid A/V presentation and get to keep the old extras as well. 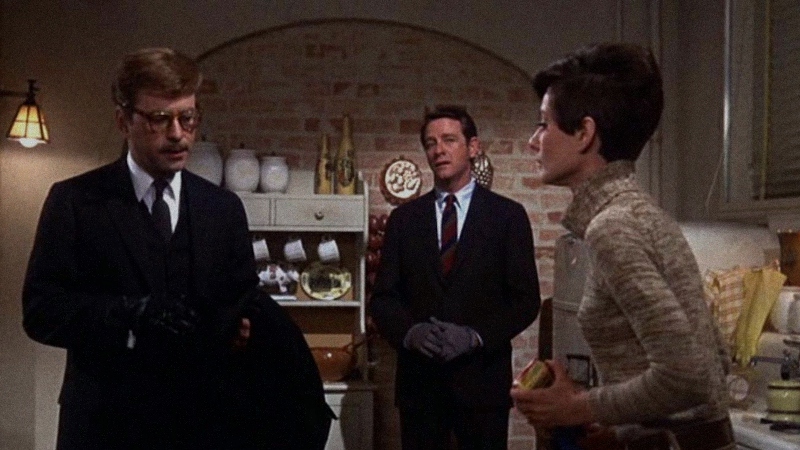 Whether you saw this one theatrically or it's new to you, Wait Until Dark is a great little thriller with more than a few surprises around every turn. Presented in its original 1.85:1 aspect ratio, Warner Archives' 1080p transfer of Wait Until Dark looks to be several notches above their parent company's 2003 DVD. Although hardly a visually stylish production (remember, more than 90% of the of film takes place in a small lower-level apartment with mostly artificial light), the boost in resolution, clarity, and colors gives it a more natural appearance. The improved contrast and black levels are appreciated as well, especially during several dark---and completely pitch-black---sequences later in the film, which certainly boosts its overall effectiveness. Texture and grain are also handled perfectly, giving Wait Until Dark a pleasing and film-like appearance. Overall, it's fine work that should satisfy die-hard fans of this influential thriller. Though it's even less attention-grabbing than the modest visuals, this DTS-HD 1.0 Mono presentation handles Wait Until Dark's claustrophobic but crystal-clear atmosphere just as well. Dialogue and Henry Mancini's offbeat score are balanced well without fighting for attention, with solid dynamic range that's more substantial than expected. Optional English subtitles are included during the main feature, but for some reason they're formatted in all caps. Both primary extras from Warner's 2003 DVD are ported over here, including a mid-length Interview with Alan Arkin and producer Mel Ferrer, as well as two different Theatrical Trailers. It's great that both supplements have been ported over...but given the film's lasting influence and history, it's a shame we don't get any brand-new ones. 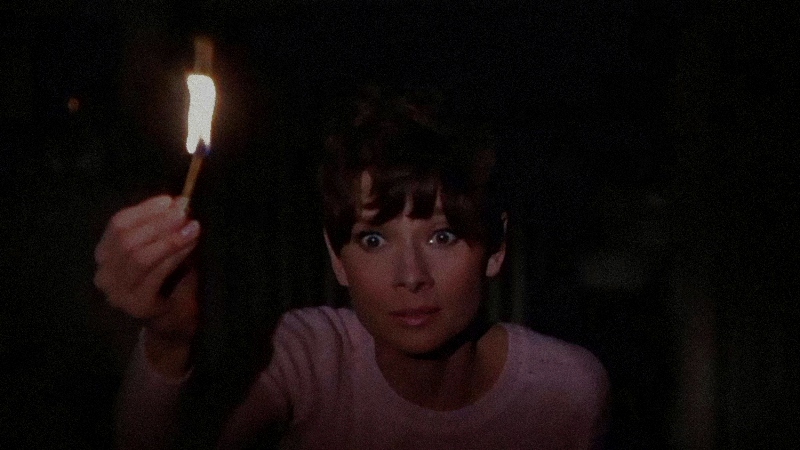 Wait Until Dark remains an effective and entertaining close-quarters thriller based on excellent source material, even if the setup and scheme feel more than a little convoluted and unbelievable at times. It's the kind of film that's easy to get sucked into if you're willing to go along for the ride, and the terrific lead performances by Audrey Hepburn, Alan Arkin (only his second big-screen appearance), and Richard Crenna carry most of the weight and suspense perfectly. Warner Archives' welcome Blu-ray presentation of Wait Until Dark easily beats their parent company's 2003 DVD, offering a notable A/V upgrade and the same slate of bonus features. It's a nice package from a boutique label that's really putting in great work as of late. Recommended for die-hard fans and newcomers alike.